Invited by the Chairman of the UNSC Committee established pursuant to resolution 1540, the Chairman of the MTCR, Ambassador Piet de Klerk, took part in the open consultations on the review of this resolution. The consultations were held in New York from 20-24 June as part of the 2016 Comprehensive Review process that allows the 1540 Committee as well as UN Member States to assess the status of implementation of the resolution and associated challenges. Resolution 1540 aims to prevent non-State actors from acquiring nuclear, biological, and chemical weapons and more particularly their means of delivery, and obliges all UN Member States to establish appropriate domestic controls over related goods and technology to prevent their illicit trafficking. The resolution also recognizes the importance of multilateral arrangements contributing to non-proliferation, such as the MTCR, and the need to enhance coordination of efforts on national, regional, and international levels in order to provide and strengthen a global response to the proliferation of weapons of mass destruction and their delivery systems. 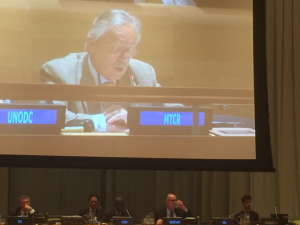 In his address Ambassador De Klerk remarked that much of the work and objectives which both the 1540 Committee and the MTCR pursue are vastly complementary. However, activities of both 1540 and the MTCR do not yet seem to be mutually reinforcing and greater synergies could be sought. The MTCR Chair assured that the MTCR stands ready to provide any kind of assistance to the 1540 Committee that may be required, given that the regime disposes of unique expertise and know-how in the area of export controls of relevant missile technology.